In the world of diamonds, VVS is a diamond clarity grade which is divided into two subsections: VVS1 and VVS2. The acronym stands for ‘very very slightly included’, while the numbers further scrutinize the clarity of the stone, with a VVS1 denoting a slightly higher clarity grade than a VVS2. Clarity grades are determined by the amount of inclusions or natural deposits within the diamonds, and the blemishes or scratches on the surface of the diamond. In order to be graded, a diamond must undergo a stringent process of analysis, both by eye and under a 10x magnification microscope. The diamond is viewed from every angle. Darkfield lighting is used to reveal certain characteristics, while strong overhead lighting helps to assess whether inclusions rest on the surface of the stone or internally. The expert may use the microscope to zoom in on particular inclusions to determine what they are (cloud, crystal, feather, and so on) but the final grade will be determined at a 10x magnification only. Understanding the process of clarity grading also highlights the importance of having a diamond assessed by a leading institute. The above process would be a minimum requirement for laboratories such as the GIA or AGL, however lesser establishments have been known to grade their diamonds in normal light by simply using a 10x magnification loupe. Although a professional will be able to ascertain certain characteristics by eye and by using a jeweler’s loupe, the only way to get a clear and definitive result is by using specialized lighting and equipment. To the naked eye, VVS2 Diamonds look virtually identical to VVS1 diamonds and even Internally Flawless diamonds. Inclusions are barely visible under 10x magnification—and that’s when it’s being evaluated by a trained professional. Even then, it generally takes ample time for a trained eye to locate the imperfections. Although technically a lower grade than an IF or FL diamond, the VVS stone offers the same beauty and flawless appearance when viewed by eye. Only professionals with a 10X loupe will be able to determine the difference between a flawless diamond and a VVS diamond. Although they give much the same visual beauty as a flawless diamond, a VVS stone will carry a much lower price tag. 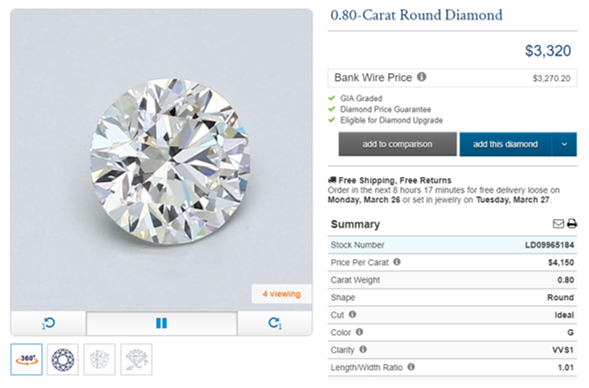 I have used Blue Nile to compare the prices of a VVS1 diamond and an IF diamond. Both carry the same color, carat and cut grading. 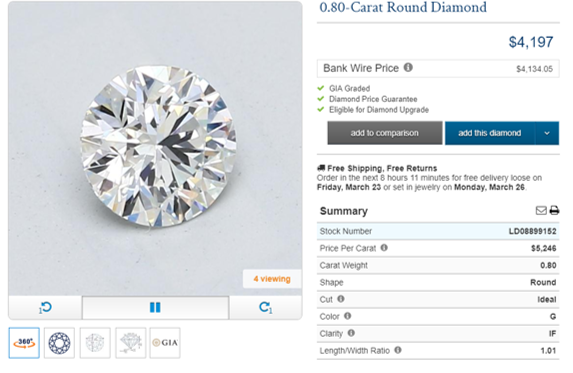 There is a price difference of $877, but you will also notice that the price per carat has also increased by $1,096. It is worth mentioning that I was unable to compare the price of a VVS1 diamond with an FL diamond. Despite the huge inventory that Blue Nile offers, flawless diamonds are extremely rare. This is another reason many people will opt for a VVS stone. It can be very difficult to find a flawless diamond that also meets your requirements for color, carat, and cut. I would recommend starting with Blue Nile, as they offer the largest inventory of loose diamonds. 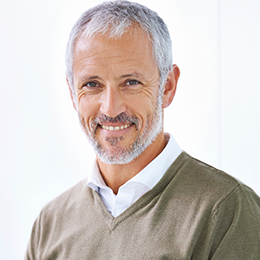 For the best overall quality, I would opt for a Whiteflash diamond as the cut quality of their in-house A CUT ABOVE® diamonds surpasses all other retailers. A VVS diamond is a thing of beauty. These stones are usually completely eye-clean, meaning they give the spectacular visual impact of a flawless stone, but without the huge price increase. Whether online or in a jewelry store, be sure to opt for a GIA or AGS certified diamond to ensure the grading is a true VVS.